this blog has been a thing for almost a year! i started gracefulleats a couple years ago, but my first post on gracefulleats.com was on November 23, 2017. from there, i’ve had 32 more blog posts, and have used more butter, eggs, and sugar than i’d like to admit. so, welcome to my 33rd blog post! While this won’t be one of those posts where I reflect on everything gracefulleats-related or 2018-related, can I just say that I’m thankful for this outlet? I don’t post much, but i do bake often- whether it’s because of stress, potlucks, birthdays, or just because. this season of life has been tough, and you’ve seen it here multiple times- all my complaints about struggles with adulting, life changes, promises to be thankful and failures in doing so, etc etc. Baking has been an outlet for so many years, and I hope it’ll continue to be that way for a while. the world spins a little too quickly for me, and my mind can’t seem to grasp what’s going on in each circumstance. but i know that at the end of the day, there’s a little corner in the kitchen waiting for me to be myself. it’s thanksgiving today, and though I don’t show it often, I have much to be thankful for. But since, after all, this is a baking blog and I’m quite sure you’d much rather read about banana bread french toast, let me just say that I’m thankful for this season of life. so, tl;dr, happy thanksgiving, and here’s some banana bread french toast! I first had banana french toast at a brunch spot in San Francisco with my high school friends. We family styled a couple appetizers, so the six of us shared three slices of this exquisite french toast. It was amazing. It was rich, warm, and hearty, with an extra layer of sweetness from the bananas. The texture was different than your typical french toast, because after all, banana bread is essentially cake called bread, and typical french toast is made with actual dough-y bread. bake a loaf of banana bread; eat half and save the other half. 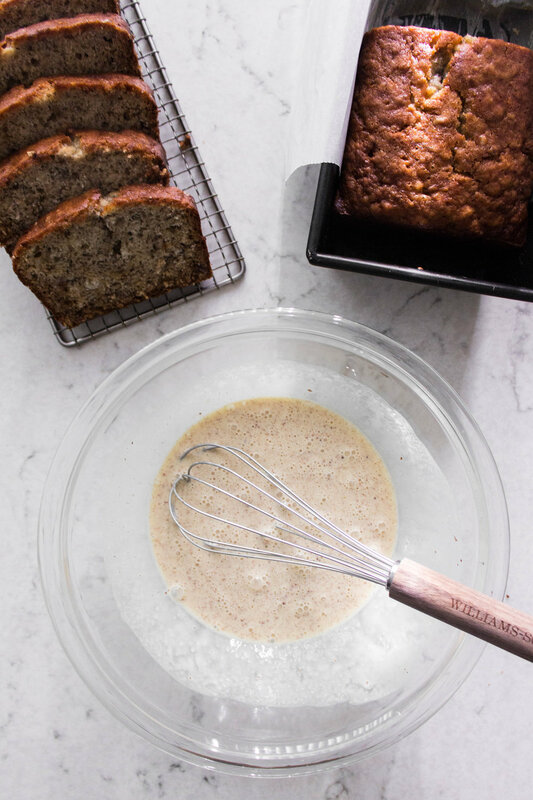 mix together eggs, heavy cream, vanilla, and cinnamon- no added sugar here because banana bread is already on its own level. 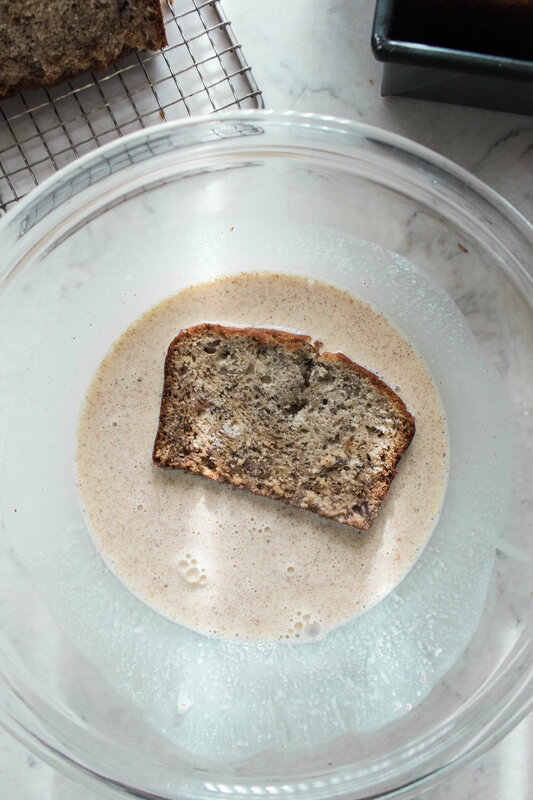 slice up the banana bread, dunk it in the heavy cream mixture, and throw it onto a hot and buttered pan until both sides are crispy to your liking. serve with fresh whipped cream, banana slices, and honey- all optional, but really, just do it. voila! forget the turkey this year; let’s just have french toast. for the banana bread: I used this recipe that I’ve already posted on this site- highly recommend, though slightly biased. You want a banana bread that’s fluffy, but not so soft that it’ll fall apart when it’s soaked in the heavy cream mixture. The one i have on my site is tested and true. for the french toast: in a large bowl, whisk together the eggs, heavy cream, vanilla, and cinnamon. over medium heat, heat a large skillet or griddle. add a dab of butter to the pan. working quickly, in case your butter starts to burn, dip each slice of banana bread into the egg-heavy cream mixture, coating both sides completely. place the coated slice onto the buttered surface, and cook until it’s golden and crispy to your liking, about 2-ish minutes per side. repeat the process-dunk, coat, fry, flip, fry- until you go through all your slices or heavy cream mixture. 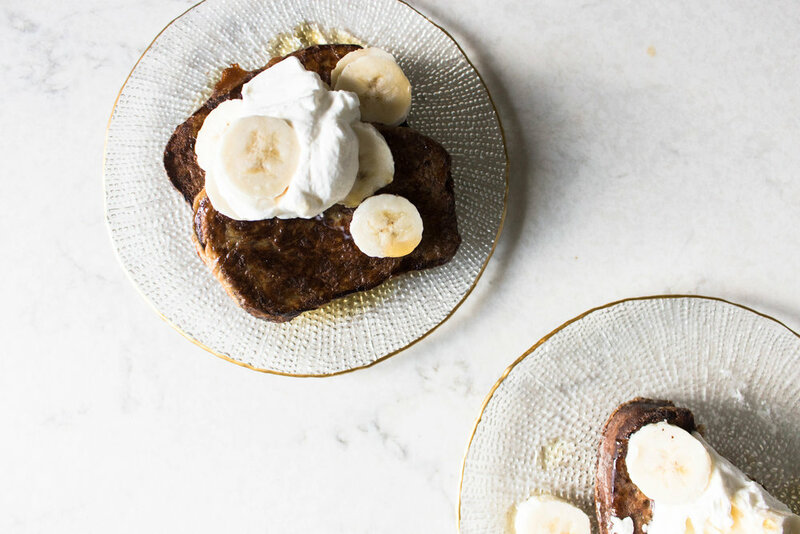 serving options: serve each banana bread french toast slice with sliced bananas, fresh whipped cream, and sliced bananas.